Home > Landscapes, Lifestyles, Nature, Uncategorized, Waterfalls	> Another blog? Just what we need…another blog. The blogosphere has exploded over the last few years with blogs from everyone, about everything. Then, why another photography blog, and why now? Well, I have been thinking for a while that I can (a.) shoot and (b.) write, so therefore, I can (c.) blog. Additionally, and more to the point, I really wanted to show my work to more people, to as many people as possible..to everyone on Earth (OK, to most people on Earth). Whether a curse or a blessing, I see images in my mind’s eye and follow my instincts to capture what I have envisioned in my head. Then, the next best thing to the journey to (and the process of) creating those images, is sharing them with others, hence this Blog..
SAs for the Blog’s theme, since much of my imagery results from an interesting, if not somewhat dangerous, quest for the perfect image, it is titled: Adventures from Behind the Glass (photography lingo for camera lenses). If you like ethereal sea and landscapes and/or intimate, close-up portraits of animals and jellyfish, this is your blog. No people portraits, no distress, no conflict. To the contrary, I take and exhibit images to counteract the prevalence of negative imagery we see on a daily basis. I shoot to display the natural beauty that still exists on Earth, and yes, if my images help in any way to preserve those places and/or creatures, I certainly wouldn’t mind doing my part. In the meantime, no politics here, no shock (maybe some awe), I seek to take the viewer away, to some distant, pristine location or to come eye to eye with one of the many beautiful animals we don’t usually see this close-up. So, enjoy the show. I hope this is the start of a great adventure, wherein I get to share my vision with as many people as possible. To that end, the first image posted, Niagara, has become a signature landscape image of mine and has been included in a Gallery Exhibition. Although extremely powerful imagery, there was little risk involved, just some good old ingenuity to capture this unique angle. No, as I have been asked many times, this image was not created in Photoshop. It was shot from atop a building, two and a half miles away (I checked it on Mapquest). 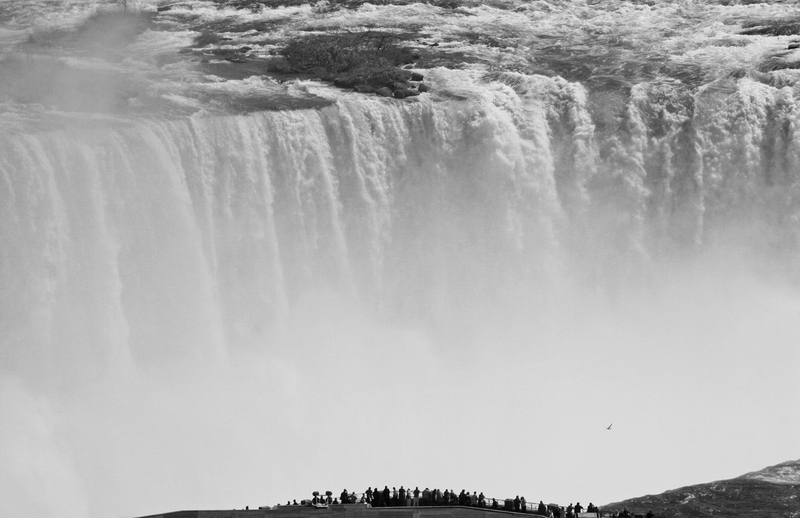 I used a long lens (Canon 100-400 L, for those that care) and a tripod to capture the power of the falls (in NY) and keep the people (in Canada) tack sharp. of your useful information. Thank you for the post. I’ll definitely return.